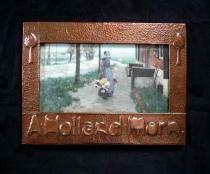 Arts & Crafts 'A Holland Morn' copper framed original litho print of a Dutch flower-seller after George Hitchcock. The hammered frame repousse decorated with stylised Voysey type tree motifs to top and title below. George Hitchcock (1850-1913) was an American Artist born in Providence, Rhode Island and exhibited in Paris and the Netherlands.